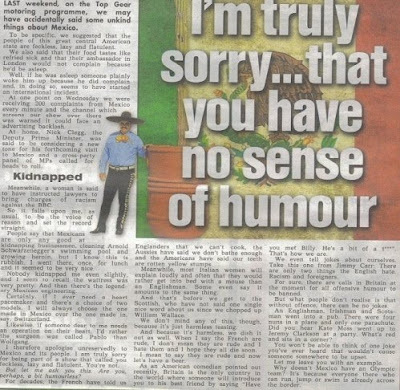 Les transcribo la columna de Jeremy Clarkson en The Sun respecto a la controversia con el asunto de México. A mi se me hizo buenísima, es el estilo de Jezza. Last weekend, on the Top Gear motoring programme, we may have accidentally said some unkind words about Mexico. To be specific, we suggested that the people of this great American state are feckless, lazy and flatulent. We also said that their food tastes like refried sick and that their ambassador in London would not complain because he’d be asleep. Well, if he was asleep someone plainly woke him up because he did complain and, in doing so, seems to have started an international incident. At one point on Wednesday we were receiving 200 complaints from Mexico every minute and the channel which screens our show over there was warned it could face an advertising backlash. At home, Nick Clegg, the Deputy Prime Minister, was said to be considering a new tone for his forthcoming visit to Mexico and a cross-party panel of MPs called for heads to roll. Meanwhile, a woman is said to have instructed lawyers to bring charges of racism against the BBC. So it falls upon me, as usual, to be the voice of reason and set the record straight. People say that Mexicans are only good at kidnapping businessmen, cleaning Arnold Schwarzenegger’s swimming pool and growing heroin, but I know this is rubbish. I went there, once, for lunch and it seemed to be very nice. Nobody kidnapped me even slightly, and I seem to recall the waitress was very pretty. And then there’s the legendary Mexican engineering. Certainly, if I ever need a heart pacemaker and there’s a choice of two models, I would always choose the one made in Mexico over the one made in, say, Switzerland. Likewise, if someone dear to me needs an operation on their heart, I’d rather the surgeon was called Pablo than Wolfgang. I therefore apologise unreservedly to Mexico and its people. I am truly sorry for being part of a show that called you feckless, lazy, and flatulent. You’re not. But let me ask you this. Are you, perhaps, a bit humourless? For decades, the French have told us Englanders that we can’t cook,. the Aussies has said we don’t bathe enough and the Americans have said our teeth are rotten yellow stumps. Meanwhile, most Italian women will explain loudly and often that they would rather get into bed with a mouse than an Englishman. Some even say it amounts to the same thing. And that’s before we get to the Scottish, who have not said one single nice word about us since we chopped up William Wallace. We don’t mind any of this, though, because it’ s just harmless teasing. And because it’s harmless, we dish it out as well. When I say the French are ride, I don’t mean they are rude and I hate them and I hope they die soon. I mean to say that they are rude and now let’s have a beer. As an American comedian pointed out recently, Britain is the only country in the world where someone will introduce you to his best friend by saying “Have you met Billy. He’s a bit of a t***.” That’s how we are. We even tell jokes about ourselves. Take this one from Jimmy Carr: There are only two things the English hate. Racism and foreigners. For sure, there are calls in Britain at the moment for all offensive humour to be banned. But what people don’t realise is that without offence, there can be no jokes. An Englishman, Irishman and Scotsman went into a pub. There were four nuns in a plane and only one parachute. Did you hear Kate Moss went up to Jeremy Clarkson at a party. What’s red and sits in a corner? You won’t be able to think of one joke you’ve ever heard that wouldn’t cause someone to be upset. Let me leave you with an example.